joanofdark.com: Yay for working skates! I've been bitching and bitching about my horribly bald wheels for weeks now. 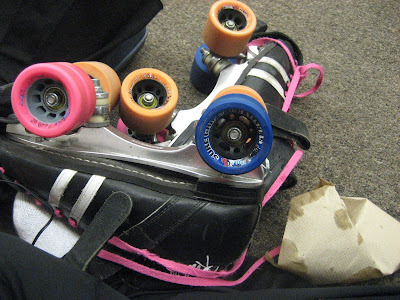 Finally, at practice Monday night, my skates told me they had had enough! I noticed during pyramids that I was drifting even more than usual. I was forcing my skate to turn, to the point where it felt like my ankle was going to snap. Finally, during a brief moment of standing still, I lifted my right leg up and realized that my front wheels were just dangling from my skate! Oh yea... when was the last time I tightened my trucks???? Ran over to the bench, and tried to tighten... hmmm. Not getting any tighter, even though I could feel my toes getting squished with every turn of the wrench. Called Coach Rick over, and he took one glance at my trucks and said the doom words, "your bushings are shot, you need new ones". Which I heard as, "Yo Joan, I know you're broke, but your skates won't make it to the game without spending more money." Crap, crappity crap. Not only did this mean I finally had to cave and get new wheels, I had to pay for rush delivery, and new bushing. Gah. But wait, being the clever, thrifty girl that I am, I remembered that I had my old 125's! Those were great skates! They should work right? (They are actually those pinstriped numbers you see in my blog picture up top). I took them to the space on Wed and tried doing a few laps. Oh hell no. It felt like switching from comfy, worn chucks to super chunky platforms. I was clumsy, tripping all over the place, and listening to the squeak of nylon trucks... no thank you. So I caved. I ordered some Answer pusher wheels and some new bushings. After some frantic phone calls, I managed to snag some for a grand total of $30, with free shipping. Thank the derby gods! I still need to order some new wheels overall, which I will do Monday morning. That will set me back about $100. I'm not looking forward to it. But at least I get to skate tonight at practice, without breaking my dang ankle. Poor skates. They need some TLC. FYI, that pic is from the end of '07. I'm on the same wheels. Eeek! Bad derby girl!